You may recall that I visited my Zia last May and returned to Chicago with a number of recipes to share. Though it may have taken a while, today’s post is the last of those recipes, even if not quite what I had planned. I had a devil of a time finding ramps this past Spring. My normal vendor didn’t harvest any and I was always just a bit late with my other sources. (Evidently ramps, like porcini mushrooms, are in big demand by the area’s restaurants.) Surprisingly, at the very end of the season, my fishmonger had some for sale. I bought up what he had, hoping that they would “keep” the 4 days before I left for Michigan and they did — kinda. Upon my arrival at Zia’s, I unwrapped the ramps, only to find the leaves to be a wilted, soggy mess. I quickly discarded them and kept the bulbs. This meant I would need something green for my ravioli and Zia and I decided fresh spinach would make a nice substitute. My attention now focused on the morels. Known to but a few, there is a place near Zia’s home where morel mushrooms grow. Living 400 miles away, it is purely a matter of luck for me to be present when the pock marked fungi appear. Nonetheless, everyday I trotted out to the morel patch to see if anything had sprouted and everyday I returned home empty-handed. On the 4th day I gave up. Having had an inkling that this might happen, I had brought a package of dried morels with me to Michigan and used them in today’s dish. By the way, I continued to check the patch everyday until I left and none ever appeared. 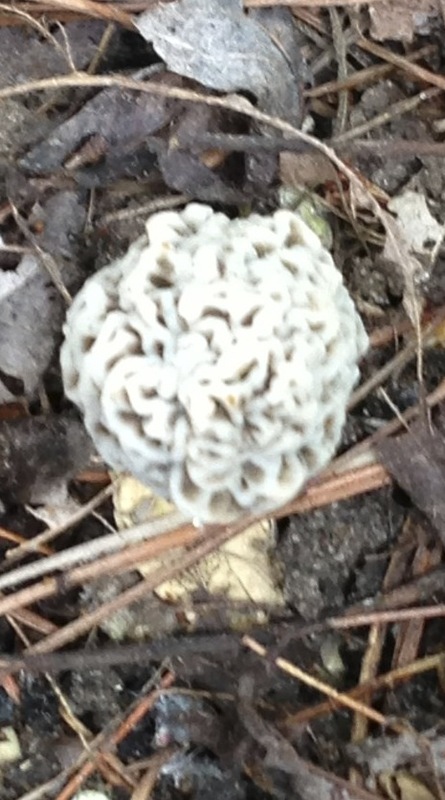 I did find one morel, however, far past its “use by” date, growing right next to Zia’s porch. I left it alone so that its spores could work their magic. I’ll be back next Spring. Now, I know that it’s a little late in the year to be posting this recipe, both ramps and morels being out of season, but I did promise to post it. If you wish to prepare this now, you can follow my lead and use dried morels — a far cheaper substitute — and you can use shallots instead of the ramps. No, shallots and ramps are not the same thing but the shallots are readily available year-round and you won’t be at all disappointed with the ravioli. In a frying pan, heat the butter and olive oil over med-high heat. Add the spinach and sauté until cooked through. Use a slotted spoon to remove the spinach to cool. Using the same pan, sauté the diced ramps until translucent, remove from heat, and allow to cool. Once cooled, place the spinach in a clean kitchen towel and wring out as much liquid as possible. In a mixing bowl, add the spinach, ramps, nutmeg, ricotta cheese, Pecorino Romano, salt, and pepper. Mix thoroughly. Refrigerate for a few hours or overnight to allow the flavors to meld and the cheese to firm, making it easier to work with later on. To make ravioli using ravioli dies/molds, please click HERE to see an expert at work. There you’ll, also, find directions for cooking the pasta pillows. In a frying pan, add the butter and olive oil over med-high heat. Add the garlic and sauté until fragrant, about 90 seconds. Add the morels and sauté for a few minutes, just long enough to give them a little color. Add the wine and sauté until all but gone. Add the mushroom soaking liquid and thyme and reduce until the consistency you like for the ravioli. Add the remaining butter and season with salt & pepper to taste. Use to lightly dress the ravioli prepared above. Serve immediately garnished with grated Pecorino Romano cheese. Be aware that there are 2 types of mushrooms, known as false morels, that resemble morels but that are inedible. Do not go foraging for morels unless you know exactly what you are looking for. As is the case with all mushrooms, if in doubt, throw it out. Morels should not be eaten raw. Stomach distress may result if they are not fully cooked before being eaten. Soaking them is not cooking them. 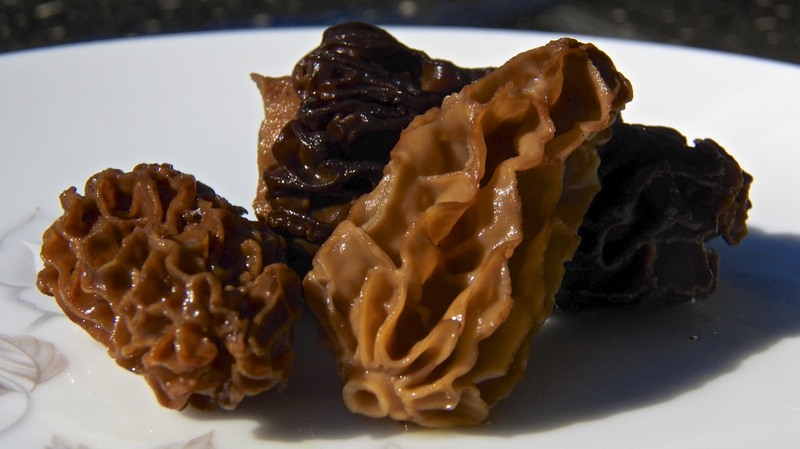 To re-hydrate morels, soak them in lukewarm water for 30 to 60 minutes before needed. Unlike most mushrooms, it wouldn’t hurt to first briefly hold them under running water to clear any grit that may be in the dimples. This is the time of year when gardens in this area are producing tomatoes of all shapes, sizes, and colors. If you don’t stay on top of the situation, you’ll soon be swamped with ripe tomatoes — and that’s true even if you’ve an Evil Squirrel to battle. Today’s blast from the past is a delicious way to utilize the excess. In fact, the more ripe the tomatoes, the better the dish. 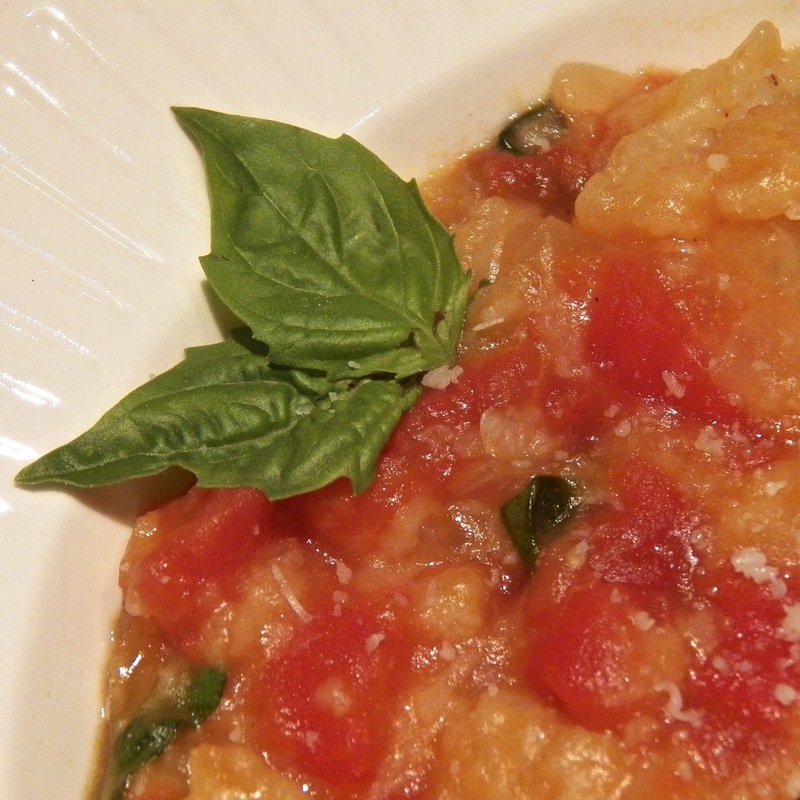 Pappa al Pomodoro, is a delicious soup that could not be easier to prepare. Just click HERE to learn all about it. This entry was posted in Home-Made Pastas, Make It Yourself, Pasta/Rice/Soups (Primi Piatti) and tagged family recipes, Food, Italian, Recipes by ChgoJohn. Bookmark the permalink. My mouth is watering just reading the description and looking at those wonderful macro shots of the ravioli. I don’t think I have ever had ramps? Morels bring back memories of morel hunting as a young girl with my grandparents at their cabin in northern Wisconsin! I don’t think I have had morels in that many years! Thank you, Kat, for the compliments. Ramps are wild onions and they only grow in Spring in the Easter part of the North America. One legend is that Chicago’s name comes from the Native American name for wild onions. Milder than normal onions, they’re only around for a couple weeks in your area in Spring. What wonderful memories you must have of going morel hunting with your Grandparents. I wish I was more familiar with the type of conditions needed to grow morels. I’m sure there must be more patches of them in Zia’s area. I’m just going to have to widen my search area. I just know that wherever there are morel patches, there are people keeping their locations secret! A morel patch is always a special find. These look superb John. I adore mushrooms (and ravioli) so I know I’ll love these. These homemade pastas must taste sensational, well done! Wow that all looks so yum! Cheers. Thank you for visiting and taking the time to leave a nice comment. Another fabulous Bartolini recipe! Unfortunately ramps are not available around here, so I’ll have to make due with shallots or perhaps spring onions? Your reconstituted morels look amazing. I’m lucky to find one specimen that big and nice in one package, and those packages don’t come cheap. Is spinach always to be included, or only if the greens of the ramps have wilted? The phrase “pasta pillows” always gives me a cozy feeling. I was inspired by your blog to order dies for making ravioli, and was just this morning wondering what filling to make. You’ve come to my rescue; I am going to dig out those dried morels I’ve been hoarding! You’ve got the dies? Yay! That’s great news. Beyond today’s, I’ve a few posted several other filling recipes, so, I’m sure you’ll find one to your liking. I’m here, too, should you have any questions. Thank you, Massi. I hope next Spring to be there when the morels are growing. That will be fantastic! OK, Mandy, then a Spring visit it is! Come at the right time and you can help me pick the morels. Oh, let there be enough so that 2 are needed to harvest them all. Wishing you a great day, too! Thanks, MD. This was a great day for Zia and me. We really enjoyed ourselves. John that’s superb. Great ingredients going in there and I like the sound the morel based sauce! Thanks, Phil. That entire week was something really special. Next year we’ll do it with fresh morels! Like others I don’t think I’ve ever had ramps, but I know I’d enjoy this meal. what is it about mushrooms and thyme as a flavour combination that simply works so well?! Thanks, Claire. I don’t think ramps grow on your side of the Atlantic, sorry to say. I don’t believe they can be cultivated so I don’t think many can be exported. Like you, I find the mixture of thyme and mushrooms to be irresistible. I don’t know why or how it works but it surely does. This is what I love about your recipes, you expose me to so many different ingredients and flavors! I’ve never heard of a ramp! And I have yet to try a morel! I’m clearly sheltered. Thank heavens I have you to tell me all about these exquisite tastes! Who needs a restaurant? WOW! I returned to watch the expert create ravioli and shared it as it is such a terrific break down of the “how-to”, illustrated so well with your photographs. This ravioli looks so hearty and almost meaty. (I don’t mean that in a bad way) Satisfying to the palate might be a better choice of words. Enjoyed reading about your visits and hope for the fungi appearing. Everyone enjoys reading your posts, even if they aren’t firing up the stove! 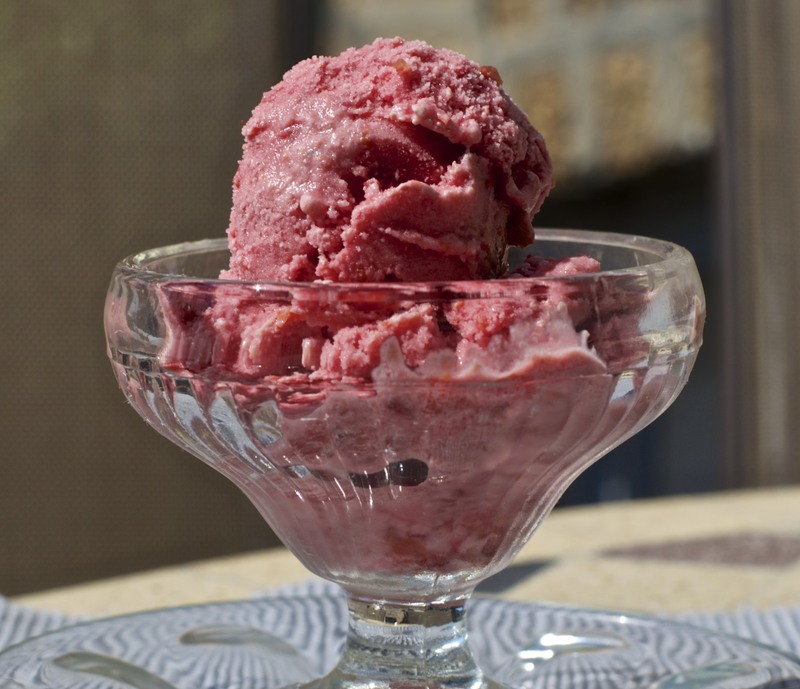 And the frozen delight is perfect to crown the summer as we are experiencing a return of weather’s heat and mugginess after fall like temps. This did turn out to be a good ravioli and we both enjoyed that dinner. I’ll be going a little earlier next May and hope to find some morels then. I don’t know what we’ll do with them but Im sure we’ll think of something. Now, with kids heading back to school, Summer returns with a vengeance. I broke out the ice cream machine just in time! Looks beautiful and delicious! How thin do you roll your pasta sheets? I usually go to #5 and get frustrated with the results…. Thank you. My rollers are at their widest when at a setting of 1, and thinnest when set to 9. We normally use pasta rolled through no. 5 for lasagna sheets; through no. 6 for ravioli and linguine/fettuccine/pappardelle/etc; and, through no. 7 for small raviolini. Those are the settings when using ravioli dies/molds. I also have ravioli making attachments for my KitchenAid mixer and for my manual crank pasta machine. 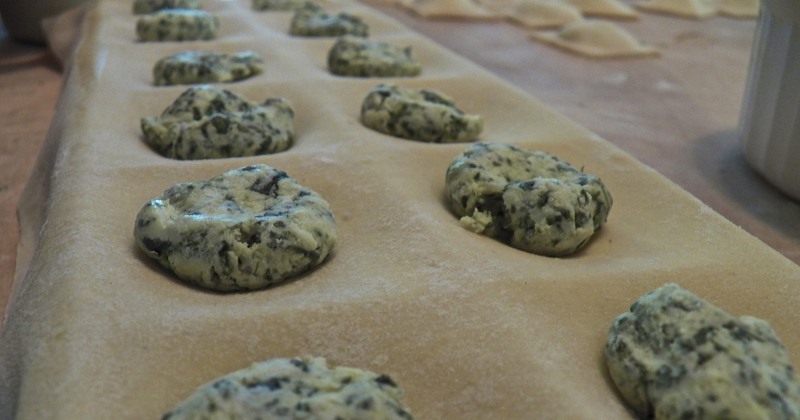 They require a thicker dough, no 4 or 5, to properly seal. I do not use them at all. My family always used thinner pasta and I don’t find ravioli made with thicker pasta to be as appetizing. I hope this helps. I’ll certainly try to answer whatever other questions you may have. Morels will always remind me of one of the most romantic dinners I’ve ever had in Paris with my beloved hubby…. chicken with morels sauce in a place in the 7eme. ah, sweet memories! You, the Ravioli Emperor, strikes again with another brilliant recipe! Ah, Paris. Now that’s a wonderful city! I’ve many great memories of my visits there. Thanks, Sally, for you kind words. Ravioli making is really fun, once you get the hang of it and we love incorporating new ingredients into the fillings. Beautiful pics. Even though I just had breakfast I would love to have some of this now! That sauce would make any meal amazing! Morels are king of the shrooms in my book. We walked miles every spring to find them when I was growing up. Mom would make mushroom gravy and biscuits and it was close to heaven. One spring we had bread sacks full of them, enough to give to neighbors, which was rare. Funny how food stirs such memories. Morel mushroom gravy? Bread sacks full? That sounds fantastic, Judy. We’ll never get that many morels from this little patch. We thought we’d be lucky to get enough for our ravioli dinner. Still, I need to do some more investigating. I bet there are other patches around. We just have to find them. I know firsthand about food stirring memories. Many of those that I write about have been brought to mind by a dish or recipe. It’s truly an amazing thing. Well here is another one who will have to substitute, but this is very much my kind of recipe and I cannot wait to make it. Love the simpleness of the sauce . . . oh, bye the bye, came here the long way – have just had to resubscribe to your posts: the gremlins have got to most of my subs, it seems! Grrr . . . Thank you, Eha. Yes, ramps only grow in the Eastern portion of North America. You folks Down Under will need to make substitutes. Shallots, mild Spring onions, or new leeks would work. Those gremlins have been busy. They visited me a number of weeks ago. It’s such a nuisance! Sorry that it’s your turn to endure it, Eha. I don’t think we have any ramps in Australia – at least I haven’t seen any. There were heaps in East Tennessee when I lived there. I love how you kept the bulb and used spinach. That’s cooking from the heart. Thanks, Maureen, and I think you’re right. I think ramps only grow in eastern North America. I don’t think they can be cultivated and doubt if they grow in large enough numbers to export. As it is, they are close to extinction in some areas. As for the spinach, Zia and I were not going to let those ramps go to waste! Necessity is the Mother of Invention! Oh boy! This really takes the cake. Though I haven’t used ramps but once, since they are hard to find-I love morels and mushrooms of any kind. You are killing me here and I am ready for a pasta fix. This could do it! I am bookmarking this for next spring. I got skunked on morels this year too. I’m just hoping to get enough to make a dish of pasta for Zia and me. I saw somewhere that if you thaw morels before cooking, they get mushy. The author thought that if they were put directly into a hot pan with oil or butter, while still frozen, that they would cook better. I’ve tried to find that link but can’t. If I do locate it, I’ll be sure to send it to you. I wish her many successful hours spent foraging next Spring! Ramps are so hit and miss – usually miss, in my experience, alas. Although I often see them at farmer’s markets and some specialty markets in the spring, I can never count on finding them. Too often when I see them I’ve already committed to making something else, and they’re gone the next time I’m there. I should just buy them and squeeze them into the menu somehow. Anyway, truly nice recipe. The ravioli filling sounds delish, and I really like any kind of mushroom sauce with ravioli. Really great recipe – thanks. You summed up this Spring’s experience perfectly, John. I was ready to cook with ramps but never found them. Well, I did find one vendor who wanted $3.00 a bulb!!!! because he “knew how to harvest them” without killing the plant. People actually paid that amount! Finally, I gave up, went to my fish monger, and there they were! I’m starting earlier next year and the same goes for the morels. I’ll be visiting Michigan earlier in the Spring and hope for the best. Thanks for the visit and comment, John. This is the first time I’ve heard of ‘ramps’. They sound wonderful, partly as they’re so illusive but mostly because an onion and cheese ravioli filling sounds so delicious! I’ll have to try this with spring onions. Great post John! I am not a huge fan of mushrooms, but my husband is – I may need to make this for him! He’s first generation Italian as his father was born in Florence – we hope to visit there someday! OOHHH I’m so hungry now after reading about this wonderful dish, and studying your amazingly mouth-watering photos. You’ve really surpassed yourself with this one, John. I’d be far too scared to go foraging for morel mushrooms! I only forage for morels and for puffballs and that’s because they’re so distinctive. I’m way too fearful to look for any other kinds. Those morels are truly a thing of beauty! They really were, Kathryn — and so tasty, too! I’ve been wanting to cook with ramps for a while, but knew so little about them. Thanks for the info on when they’re in season John. 🙂 I can’t wait until spring to try this recipe though……it has too much going for it! Oh John, you guys have outdone yourselves. This sounds like so much fun to make and looks incredible! It’s a cliche to say it, but YUM!! This is all new to me–ramps and morels. This is what I love about your blog. I’m always learning something! No one ever speaks of known morel patches. They are always the best kept secrets. I hope to get back to Zia’s the first week of next May and widen my search area. If there’s one patch, I have to believe there’s another! Although there are no pigs, people are on the look out. We have to guard Zia’s puffballs so that no one pilfers them. I hope they’ll be there when I go back for the honey in September. Am wondering if garlic green would make a good substitute for ramps. Both the bulb and green are very mild, with just a hint of garlic flavor. Your morels appear quite large in the photo, did you leave them whole or cut them in 1/2 or 1/4 lengthwise? Hope the morel by Zia’s porch grows into a good size patch. How utterly delightful it would be to step off one’s porch into a morel patch! John, every time I read your pasta recipes it makes me want to make pasta, especially ravioli. 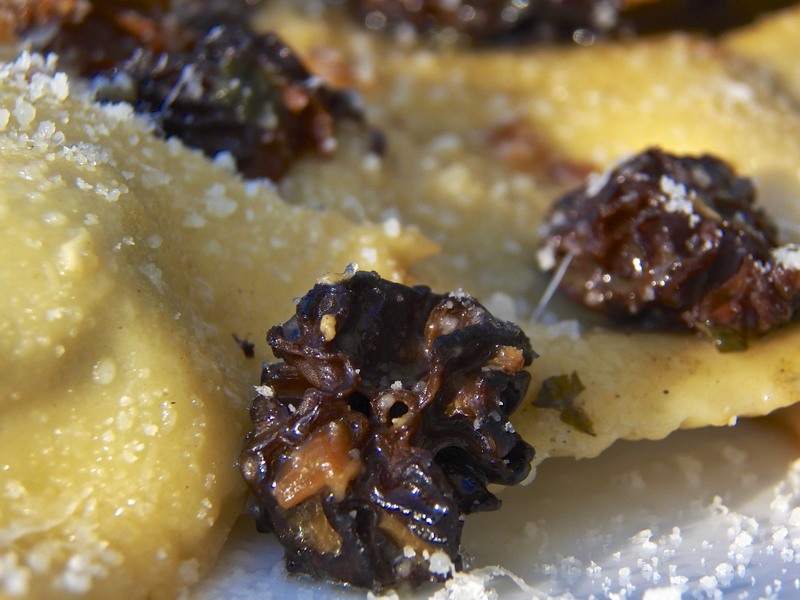 These raviolis look soooo good and pairing them with morels puts this over the top. Fabulous recipe, John, simply fabulous. I can remember the exact time and place I had my very first morel! It was just outside of Zurich, Switzerland where we were spending time with friends during a journey through Europe. My Canadian (married a Swiss) friend made the most delicious Morel risotto with fresh, gorgeous, earthy morels. You can only imagine what my mission was when we returned home: to find the elusive morel. Those day, in the late 80’s the grocery stores were not nearly as multicultural as they are now and that was a task! I did eventually find dried morels but they were so dear that I would have had to put a second mortgage on the house so my quest would have to wait until society became more demanding of international foods! That happened in the 90’s when I stumbled upon them at Price Club (our precursor to Costco). It was a reasonably sized jar with dried morels for around $8! Still expensive but at least not as expensive as my first encounter! We still don’t have the fresh ones, believe it or not! Again, I thank you my dear friend John for a lovely trip down memory lane and for sparking my impetus to find these morels again at Costco. Now to closer examine your tasty recipe. The nutmeg is an interesting addition—I have known the French to use nutmeg in meat dishes, but I haven’t seen it in pasta with ricotta, very interesting. I wasn’t exactly sure what a ramp is so I googled it; it looks very much like an onion with a leaf resembling lily of the valley (my favourite!) Does it taste like an onion, or milder? I suspect it would be mild because it would definitely overpower the mild taste of the morels int he sauce. Or would they? I must keep my eyes open for such a vegetable. Very nice recipe, thank you for sharing it with use. Thank you so much, Eva, for leaving such a great comment. What a nice memory, enjoying risotto with morels while at a friend’s in Switzerland. Fantastic! I found these dried morels at the Italian market but couldn’t remember their price. Last year I saw fresh ones but their price was over $30/pound and I quickly put down the couple I had picked. Thanks for the tip about Costco. I’ll be sure to look for them next time I go. Mom was one to use nutmeg in a number of dishes. She used a dash in the family ravioli recipe and a few other dishes like spinach. My using it here was a bit of a wink to her. 😉 You’re right about the ramps. They taste similar to a mild onion and grow in the eastern provinces of Canada, too.. You may be able to find them at your greengrocer or farmers markets next Spring. Some may make it to your markets, though, I bet most if not all are grabbed by the restaurants. That’s where most of ours go. It’s really my pleasure John, your posts always bring back such lovely memories for me. Thank you too for the tip on ramps, I’ll be sure to keep my eyes open next spring for them. YIKES! I just hope I’m not going to wish the time away, summer is rushing by way too quickly as it is! I just had dinner yet this post has made me hungry again. Oh, how I wish the story would have ended as you thought! From what I’ve read, morels will only grow once the ground warms to a certain temp. Living 400 miles away, I’ve got to be pretty lucky to time my visit for when the morels appear. I’ll still keep trying though. I think this sauce would work with pork or veal, maybe even chicken. I prefer a red wine-based sauce with beef and I think that it would overpower the morels. Looks like we’ll both be combing the hillsides next Spring. Thanks for the visit and for taking the time to leave a comment. Stop typing altogether! Thanks, Cecile, now get some rest. Those look really, really good. On a related note, please let us know if the house next to yours ever goes up for sale! Now, to me, this is more of an art form than rolling out phyllo dough! This is magic. I adore pasta but watch carefully how much I eat and I really adore ravioli, and mushrooms and, and….all of it! This sounds amazing John. Daughter #3 loves ravioli and has been going on at me to make some, I will be scouring your recipe index soon. These actually look like a good place to start. I know I’d love them. I guess it all boils down to one’s experience and comfort level. I grew up watching the women make pasta and ravioli. To me, it was a natural progression to learn how to do it. Never, though, did I see phyllo dough rolled and it looks near impossible to do. You, of course, see things exactly the opposite. THX for the Pappa al Pomodoro recipe ~ I have an embarrassment of tomatoes and then this fusion made in heaven arrives in my email. Hurrah! That soup takes me back to my boyhood every time. I hope you enjoy it, too, Toni! I have never had morel, but I have cooked with ramp. They are not widely available, but I do like their garlic aroma, though I favor the garlic scapes over them. 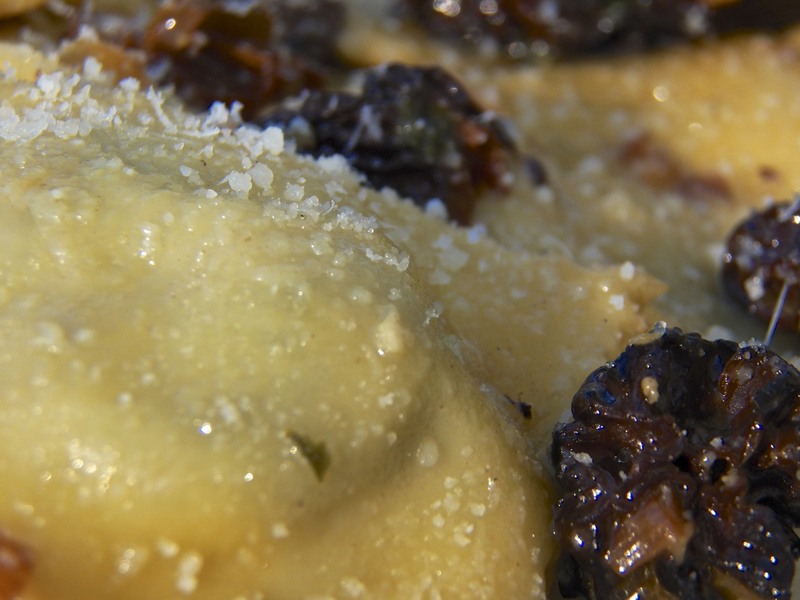 The ravioli looks so delightful, and are perfectly turned out….I am wondering if you ever considered opening a restaurant….these would vanish in no time…. OK – now you have me really curious about the flavor of both ramps and morel mushrooms. I never see either at the markets over here. However, because I love garlic/onion flavors and love mushrooms almost as much, I’m sure Bobby and I would thoroughly enjoy this ravioli dish! You make such gorgeous pasta dishes! Sounds like you’re getting your exercise hunting for some morels. Oh man! This looks great! I love ramps. They’re a new discovery for me this year and couldn’t get enough. They go so good with bacon. Thanks, Debra. Sorry to hear of your oral issues. I hope you’re not too uncomfortable. Love that your mind goes to eating ravioli now. We’ll make a Bartolini out of you yet! I don’t think you’ll see many ramps on the West Coast. They only grow here in the East. Any sent your way are sure to be snapped up by the restaurants and businesses. That happens here with most of them and we’ve got ramps growing in the countryside. I’ve seen fresh morels in one of my stores but they were ridiculously expensive. If I cannot find them in “our” patch, I’ll buy dried and be very happy with them. Take care, Debra. I hope you’re feeling better soon. Oh John, I love your food. They always have the effect to make my stomach rumble and mouth to salivate!! I really wish I can have a plate of this to try it out! Thank you so much for visiting and for leaving such a nice compliment. John, you’re killing me here. So many recipes to try, and so little time! This looks beautiful. I always knew you were a fun-gi (fun guy… apologies… dreadful pun). I’ve never heard of ramps, but we have a mushroom specialist at our market, so I will be picking his brain this weekend. Ramps are an eastern North American thing. Morels are a bit more widespread and you may be able to find some dried. Your mushroom guy should know a good substitute that’s available to you. Good luck. I’d be interested in learning what he has to say. This is definitely one dish that I will be making soon John, it looks so incredibly amazing! I’m going to get my girls to help out, they love make fresh pasta. Your photographs are gorgeous…they are magazine-worthy! Thanks, Sarah. Our puffballs don’t appear for at least another 4 weeks, probably more. The morels won’t be back until next Spring, unfortunately. I wrote a post about our puffballs and you can read it HERE, if you like. Me, too, Stefano. Zia and I really enjoyed this meal. Thanks for dropping by and for the nice compliment. Thanks, Tanya! This is such a nice surprise! I didn’t expect to hear from you for some time. I hope you and Big Man are having a wonderful holiday. I bet you can find dried morels in England. They grow in Europe and are probably available in the major cities, just like here. How nice that your herbs “waited” for you. In my experience, nothing short of a fire will kill a thyme plant. They’re pretty hardy and can survive even out winters. Now that’s a hardy herb! I have finally dragged myself out of Ontario to Chicago. It was a long a tedious journey, but I’ve finally arrived. The weather in Chicago is hot, but I guess I have to get used to it. Did I ever tell you, you could make an excellent salesman? I hear you John, so If I ever make this sauce, I’ll just use dried morels, but isn’t it even more difficult to verify the dried ones? I am really curious, though, and sincerely wonder how this sauce tastes like. I would love to taste it. I don’t know where to find morels in Ontario, so I’ve just googled and guess what I found: “Morels can’t be cultivated, so those who crave these fungi must hunt them down” I give up, so maybe next year, if you are extra lucky, be kind enough to mail me some. I am preparing to cook my risotto. At least I don’t have to forage for the gizzards and I know exactly what they look like. Thank you, John, for all the support you’ve extended and wish you a happy Friday and a very pleasant weekend. Special wishes to Max. I don’t want anyone to read this post and go out looking for morels unless they know what they’re doing. There are too many risks involved. That’s why I didn’t describe the differences between good and bad morels. I don’t want anyone to misread what I’ve written and get themselves into trouble. Dried morels have been sorted and checked. I’ve no fear of bad morels in the package. Oh, how I wish I found enough next Spring to be able to send you some! How great would that be! The reality is that I’ll be lucky to find enough for a dish of pasta for Zia and me. I’m anxious to hear how your risotto experience goes. Good luck. I think you’ll surprise yourself with how easy it is. Buon appetito! We used to make a lot of homemade spaghetti and linguine, but never ravioli. Now I can think of nothing else that I’d like to have – what a gorgeous recipe. I tend to forget about mushrooms and how incredible they can be, this is such a good reminder. Gorgeous photos! I think that’s the best encouragement, John, thank you! I’m gonna try! That’s the spirit! If you have any questions, just ask and I’ll get back to you ASAP. Good luck! Oh I love this John!!! I have to get my pasta roller out and make something…maybe this fall I will have more time…until then I keep watching you 🙂 Thank you!! Welcome home, Barb! As nice as a vacation may be, it’s always nice to walk across the threshold to one’s home. Researching this most, I read that most, but not all, mushrooms should be cooked before eating. I’d no idea, though I normally don’t get that many of the exotics. I also read that morels grow when the soil reaches a certain temp and the air another temp. That’s why they may grow on the north side of a river bed first, then the south side later on. Still, that doesn’t explain why they’re so late in your neck of the continent. I guess it doesn’t matter when they arrive, just so long as they do. i’m a huge fans of gourmet mushrooms, morel is one of the kind that i never taste before…. I’m not familiar with your perennial leeks, Celia, but they’re in the same family. If they’re mild, then I think they’d work nicely. None of the flavors in this dish are strong or “in your face.” As a result, you’ve got a well-balanced dish of ravioli. I hope you do give it a try. Good luck! Thanks for all the tips on morels. I don’t use them but I’m glad to know this info before I start! You wouldn’t consider delivering some of these ravioli by FedEx Air, would you? Buona notte, BAM! Thank you so much and it would be great fun hosting your boys. They’d be making ravioli in no time! I really do not know that much about mushrooms and certainly won’t go foraging for them. I know puffballs and morels, no more and am too afraid to learn. Some things are better left to the experts especially when a mistake can have such dire consequences. I hope you’re having a great weekend, too, BAM. Looks wonderful. I wonder if you could use scallions instead of ramps now that the season is over? Thanks. I’m sure you could use scallions, though I’d be careful. You don’t want to overpower the mushroom “sauce”. That’s why I suggested shallots. Leeks may work, too. Thanks. Leeks would be good. I’ve used scallions in dumplings before, and once they cook down enough, they actually become quite mild. Good to know about the scallions. Thanks. A must taste and have. I only had coffee so far and you made me crave for these delicious creations. Yum-yum! Have a great weekend. I’m having a comment delay this week due to construction, but am loving this ravioli with morels. 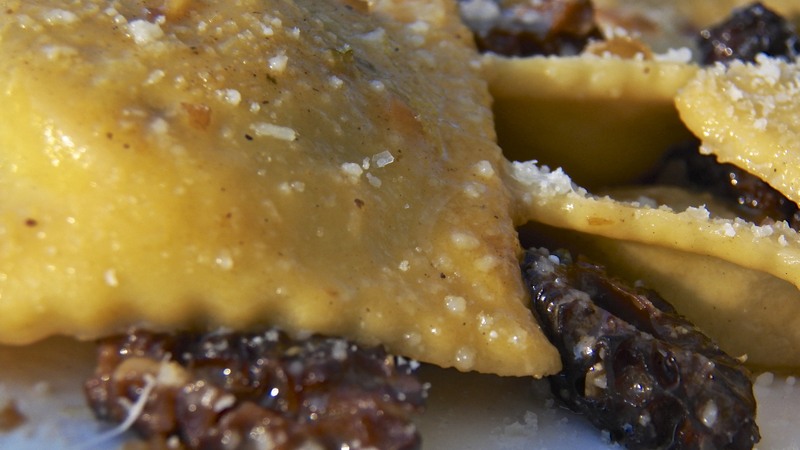 It is a truly beautiful ravioli dish and looks so earthy and rich. I hardly ever see ramps in a store here anymore. I’ve seen them on rare occasion in a restaurant, and I wonder why? The bread and tomato soup looks divine and I’ll have the soup as a starter, then the ravioli and the tart cherry frozen yogurt for dessert, please! Thanks, John! 🙂 We had some of your bolognese sauce that i had frozen with some fresh (unfortunately not made by me) pasta last night. so delish! So very glad you like it, Betsy. Oh my, this ravioli recipe sounds absolutely divine!!! Realistically, how long does this take to make? Thank you, Mary Frances. I make the filling the night before and that might take an hour. It only takes a couple minutes to make the dough but it has to rest 20 to 30 minutes, though longer is OK. I usually make the dough before lunch and then Zia and I get to work once we’ve eaten.It takes a couple hours to complete. Understand that the first couple times you fill the die, it will take you a little getting used to. Once you get a rhythm going, you can fill the die 3 or 4 times in an hour. Depending upon the size, my dies will create 48, 24, or 12 at a time. Multiply those by 3 or 4 and you get an idea of how many ravioli you can create. Your Morel sauce looks wonderful! I have no experience using morels…and that is partly due to not daring to pick mushrooms that we’re unsure about! We should be able to find morels here in Finland. Not sure if I could get morels at our local market but I can only imagine the comments my kids would make about them! However, the tomato and bread soup is something that is right up our alley, bread, tomato and cheese – usually goes over well! Wow this looks gorgeous! I’ve never been able to find ramps anywhere in Europe so I’ll have to try it with your suggested substitution of shallots! I highly doubt ramps can be found in Europe. As far as I know, they only grow wild in the eastern part of North America. I doubt if they grow in large enough numbers to be exported anywhere. I do think shallots would work, as would mild onions or leeks. Just make sure nothing too strong is used. You are so kind and once again your comment has me grinning ear to ear. I would love to fix you a dish of ravioli, though it’s too late for ramp ravioli. They are a Spring dish. I’ll have to come up with something new for this time of year. How about something with Swiss chard (silverbeet)? Any suggestions? Ramps and morels are impossible to find around here when they are in season as well. The restaurants seem to get most of them. I think you ideas for substitutions are good. Nice post. Thanks, Karen. I was surprised to learn that ramps are endangered in some parts of the East Coast. Over-harvesting is to blame, with some areas having increasingly popular ramp festivals. I fear one day they will be treated like morels, where people keep secret where the remaining ramps grow. Nutmeg and spinach go beautifully together. Excellent pictures, CJ. My favorite is the filling laid out on the ravioli dough waiting to be covered and cut. I think of all the bloggers I follow, you’re the one I want to come cook for me every day. I’d just have to remember not to go back for seconds or thirds! Exactly! Ravioli needn’t be hard. Pick your favorite ingredients, blend them, fill the pasta, and enjoy! It’s never too late to post a recipe; you’re just helping us be prepared for next year’s ramps and morel season. It’s a bit of a dilemma isn’t it; I find that by the time I develop a recipe and a post for whatever’s in season, usually the season is just about over. Oh well, that’s what archives are for! This recipe looks very good, and once again you’ve used an ingredient that I haven’t tried before, in this case the morel mushrooms. I can only imagine how good they must be. I definitely must pick some up (whether fresh or dried) and try them for myself. Hope next season, you get to harvest more of these divine tasting mushroom. Once again your culinary magic shine deliciously dish after dish. Just had breakfast but now I can’t wait for lunch after seeing you creation. Have a great week. Thank you so much. I hope I’ve better luck next Spring but, if I don’t, Zia and I will figure out something, Guaranteed. I hope you’re having a great week, too! Yum! What a great looking ravioli! Sorry to hear the greens didn’t make the journey. Spinach sounds like a fantastic substitute! Thanks, Amber, and the spinach did work pretty well. I’ll try again next year. I’d like for my Zia to see and taste the entire ramp. I just have to figure out a better way to keep them. This recipe is completely off the hook. WOW. So impressive. You totally had me at morels, by the way. Thank you for sharing. This blog is outstanding. Thank you. That’s very kind of you to say. I hope my timing is better next Spring so that I can harvest some morels. They’re always such a nice surprise. Morels are definitely worth any extra effort – agreed. Yes, I’ll be returning to this ravioli every Spring. Thank you for visiting and for taking the time to leave a comment.